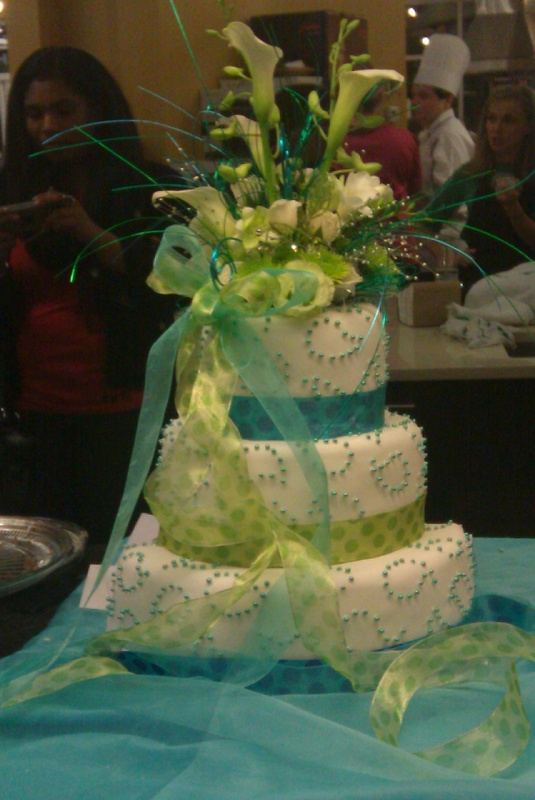 Carithers Flowers customer Carol Craig wins Atlanta area cake baking competition for charity event! Carol Craig, an Atlanta area amateur cake baking enthusiast, won a recent cake baking competition, using a cake topper supplied by Carithers Flowers. Cake and topper are pictured in the photo. The cake baking competition that Carol participated in had categories for professional, amateur and young pastry chefs. The event was the 3rd Annual Great American Baking Contest. The judging was held on Thursday, March 11th, at The Cook’s Warehouse in Atlanta. Prizes were awarded for the top three finishers in all three categories. All net proceeds from the Atlanta area event went to support the non-profit organization “Share Our Strength.” This organization is a nationwide group dedicated and working to ensure that no child in America grows up hungry. The winner of the Amateur category, Carol Craig, created a three-tiered, fondant-covered cake embellished with edible pearls and colorful ribbons, and it was topped with a beautiful flower arrangement created by Carithers Flowers. Honestly, this cake is absolutely stunning! Our hats off to Carol Craig for an absolutely breathtaking creation. Congratulations Carol! Carithers Flowers has a complete floral division dedicated to serving wedding clients in the Atlanta and Atlanta metropolitan area. The wedding division can handle your wedding from start to finish. For more information about how Carithers Flowers might be able to help you make your wedding the perfect event, please contact our wedding and event specialists at 770-980-3000, or visit our web site at (http://www.carithers.com).